Researchers strongly suspected that new planets might be coalescing inside the disk, which is about twice as wide as the orbit of Pluto. But when they took a closer look at SAO 206462 they found not planets, but arms. Astronomers have seen spiral arms before: they’re commonly found in pinwheel galaxies where hundreds of millions of stars spiral together around a common core. Finding a clear case of spiral arms around an individual star, however, is unprecedented, The arms might be a sign that planets are forming within the disk. 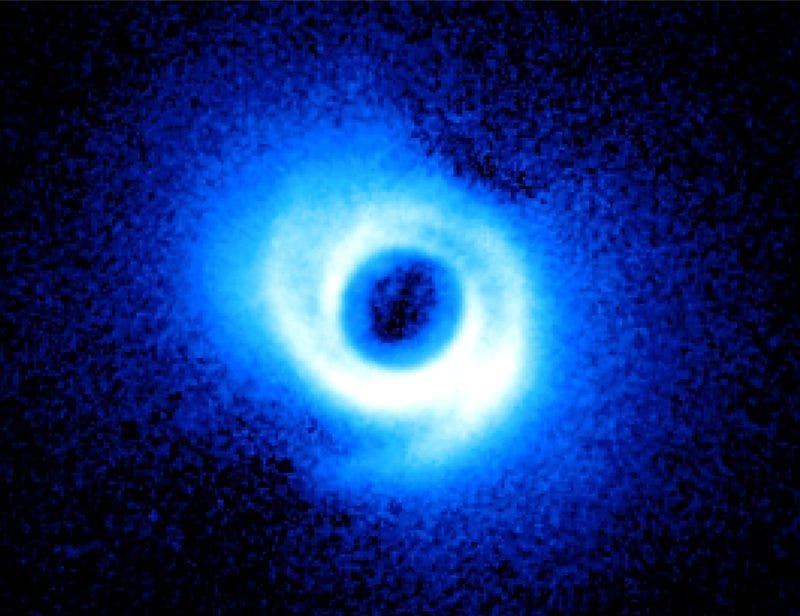 "Detailed computer simulations have shown us that the gravitational pull of a planet inside a circumstellar disk can perturb gas and dust, creating spiral arms,” says Carol Grady, an astronomer with Eureka Scientific, Inc., who is based at NASA's Goddard Space Flight Center. “Now, for the first time, we're seeing these dynamical features." Theoretical models show that a single embedded planet may produce a spiral arm on each side of a disk. The structures around SAO 206462, however, do not form a matched pair, suggesting the presence of two unseen worlds, one for each arm. Grady's research is part of a five-year international study of newborn stars and planets using the giant 8.2 meter Subaru Telescope. Operated by the National Astronomical Observatory of Japan, Subaru scans the heavens from a perch almost 14,000 feet above sea level at the summit of the Hawaiian volcano Mauna Kea. From there it has a crystal-clear view of innumerable young stars and their planet-forming disks throughout the Milky Way. "What we're finding is that once these systems reach ages of a few million years—that’s young for a star–their disks begin to show all kinds of interesting shapes,” says John Wisniewski, a collaborator at the University of Washington in Seattle. "We’ve seen rings, divots, gaps–and now spiral features. Many of these structures could be caused by planets moving within the disks." However, it is not an open and shut case. The research team cautions that processes unrelated to planets might give rise to these structures. Until more evidence is collected–or until the planets themselves are detected–they can’t be certain.